Homes and businesses throughout Austin all appreciate better security measures that can defend building occupants, valuables, and more. Home security systems and commercial security systems definitely have a lot to offer property owners but can, unfortunately, fall short in certain areas. When it comes to optimizing security among your home and business, security film is the best addition to your existing security measures. Security film paired with C-Bond offers incredible, affordable solutions for residential and commercial properties. C-Bond is the only patented nanotechnology that’s been scientifically proven to improve both the performance and strength of glass windows as well as window film products. By combining security film and C-Bond, homeowners and business owners can appreciate the best protection for the most vulnerable parts of your their property. By adding strength, durability, and flexibility to glass doors and windows, you can rest assured knowing your property is safe even when you’re not there. C-Bond glass strengthening agent is the perfect addition to any window film project, making security improved even when not using security film. Security film primed with C-Bond can defend against natural disasters, burglaries, break-ins, and much more. Specialty security film with bomb blast resistance and ballistic resistance are also available thanks to C-Bond. C-Bond for Austin Properties from Kansas City Green Window Film on Vimeo. GreenLight Window Films is proud to be the leading C-Bond window film contractor in the Austin area. We always use C-Bond for every security film project and window film installation. With quicker cure times and optimized results, you’ll be able to experience the benefits of your window film investment even faster. C-Bond is available for both residential and commercial projects. 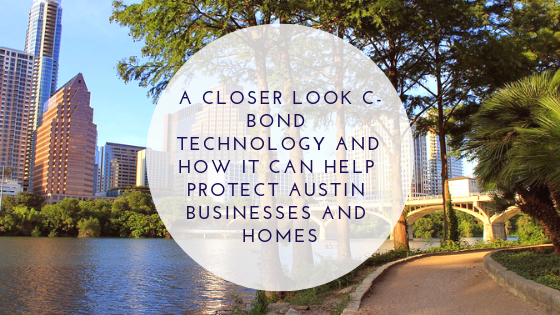 For more information regarding C-Bond glass strengthening agent and security film for your Austin property, please contact us!